Anna Bolton | Greene County News Xenia High School senior Samari Curtis signs a national letter of intent Nov. 14 to commit to University of Cincinnati, where he will play basketball. His mother, pictured beside him, along with family and classmates joined him for the signing in the high school gym. XENIA — One of Ohio’s most eligible basketball bachelors is off the market. 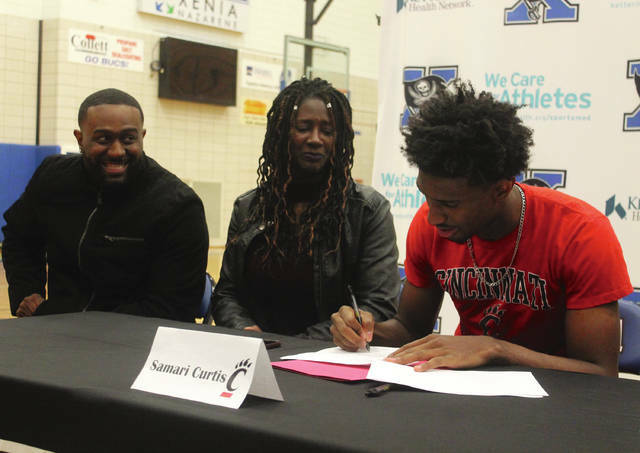 Xenia High School senior standout Samari Curtis became a University of Cincinnati Bearcat Nov. 14, signing a national letter of intent in the high school gym during the early signing period. Flanked by friends and family, Ohio’s No. 4 prospect according to 247sports.com said it was an “easy” choice. Curtis averaged 30.4 points, 5.2 assists and 5.1 rebounds per game for the Bucs, the second time he led the Greater Western Ohio Conference in scoring. He currently has 1,293 career points and needs 109 for the school record, according to a release from UC. Curtis is ranked among the top 150 players according to Rivals.com and was third-team All-Ohio last season by the Ohio Prep Sportswriters Association. Xenia opens the season Friday, Nov. 30 at Stebbins. No doubt all eyes will be on Curtis, who welcomes the attention. https://www.xeniagazette.com/wp-content/uploads/sites/32/2018/11/web1_CurtisSigns.jpgAnna Bolton | Greene County News Xenia High School senior Samari Curtis signs a national letter of intent Nov. 14 to commit to University of Cincinnati, where he will play basketball. His mother, pictured beside him, along with family and classmates joined him for the signing in the high school gym.